Francisco de Zurbarán (1598–1664), The Death of Hercules (1634), oil on canvas, 136 × 167 cm, Museo Nacional del Prado, Madrid, Spain. Wikimedia Commons. Achelous has just told the story of his wrestling match with Hercules, and how his lost horn was transformed into the Horn of Plenty, cornucopia. By this time, the floods have abated, a new day is dawning, and his guests depart the banquet. Ovid takes back the narration in his Metamorphoses, leading on to his next story about Hercules, which explains the events resulting in the hero’s death and apotheosis. Having won her hand by defeating Achelous, Hercules married the beautiful Deianira, and was returning to his native city with her. The couple reached the River Euenus, which was still in spate from the winter’s rains. 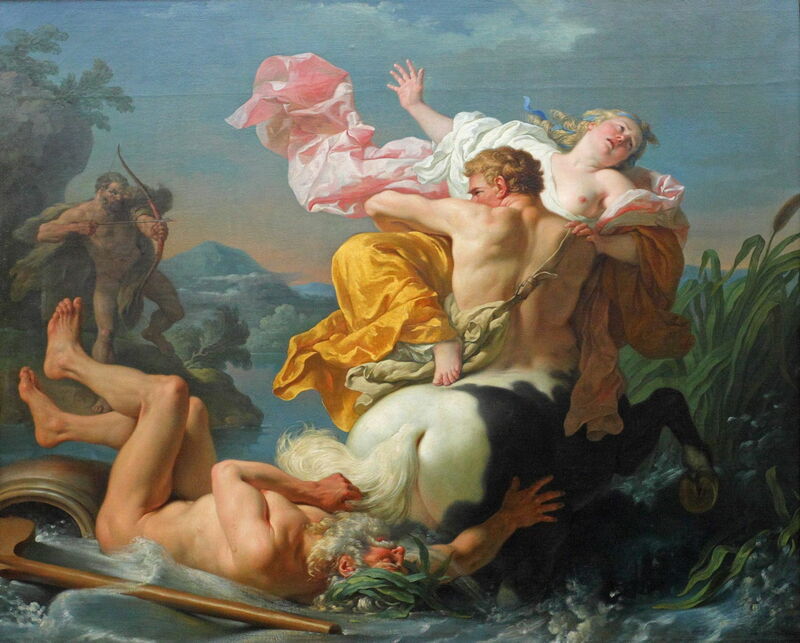 Hercules feared for his bride trying to cross the river, but the centaur Nessus came up and offered to carry her across. His deed sustained the final warning word. the deadly poison of Lernaean hydra. Years passed after Nessus’ death, and Hercules was away in Oechalia, intending to pay his respects to Jupiter at Cenaeum. Word reached Deianira that her husband had fallen in love there with Iole. Initially, she was upset, but then tried to devise a strategy to address his rumoured unfaithfulness. It was then that she recalled the blood of Nessus, and his dying words to her: “Keep this to strengthen waning love.” She therefore impregnated a shirt with that blood, and gave that to Lichas, Hercules’ servant, to take to her husband. the torture. His great fortitude was strong. he strove to pull the tunic from his back. his skin, heat-shriveled, from his burning flesh. leaving his huge bones bare. dissolved, as it absorbed the venom-heat. Hercules then cut down trees and built himself a funeral pyre. Ordering this to be lit, he climbed on top, and lay back on his lionskin. Jupiter came to his aid, calling on the gods to consent to Hercules being transformed into a god; they agreed, and Hercules’ immortal form was carried away on a chariot drawn by four horses, into the stars above. This is a long and complex story, which has been painted extensively from ancient times right through to the present. The two climactic scenes which have been the focus of attention are the attempted abduction of Deianira and Nessus’ death, and the transformation of Hercules into a god (his apotheosis). I have looked at the first of those in detail here, and the second in detail here. I have chosen the best of those paintings to show below. The first scene is one of those rare situations which reads perfectly credibly, but the moment that you try to portray it visually, you discover that the words describe a composition which is almost physically impossible, if it is to be faithful to the text. There are also differences in accounts, which place Hercules on either bank, and have his arrow pierce Nessus’ chest or back. This marvellous painting was probably made by Rubens’ workshop around the time of the Master’s death in 1640. It views the events from the bank on which Hercules is poised to shoot his arrow into Nessus. This has the centaur running across the width of the canvas, his face and chest well exposed for Hercules’ arrow to enter his chest. To make clear Nessus’ intentions, a winged Cupid has been added, and Deianeira’s facial expression is marvellously clear in intent. An additional couple, in the right foreground, might be intended to be a ferryman and his friend, who appear superfluous apart from their role in achieving compositional balance. A century later, Louis-Jean-François Lagrenée clearly understood the compositional problem, but did not arrive at quite such a good solution. Nessus, bearing a distressed Deianeira in his arms, has just reached the opposite bank, in the foreground. Heracles is on the left in the distance, and we can at least see his face, bow and arrow. There appears to be no way that Heracles’ arrow could impale Nessus’ chest, without first passing through some of the abundant Deianeira, nor his back. Lagrenée also adds a ferryman, who seems to have been knocked over in Nessus’ haste to make off with his captive. Gustave Moreau and Jules Élie Delaunay seem to have worked on a compositional solution together, resulting in Delaunay’s brilliant painting of 1870. Sadly, I cannot show this work, but you can view it here. 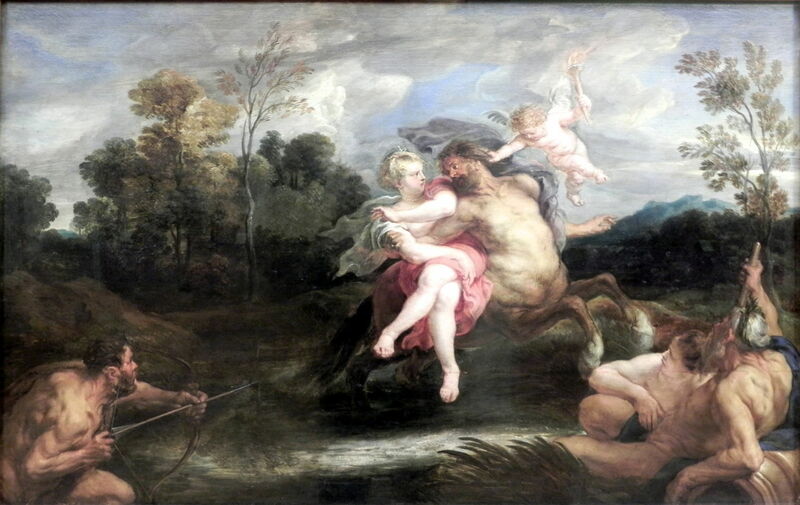 As with the two previous paintings, this alters the story so that Hercules has not yet crossed the river, but that permits the arrow to impale Nessus in the back, and its head to stand proud from Nessus’ upper abdomen. 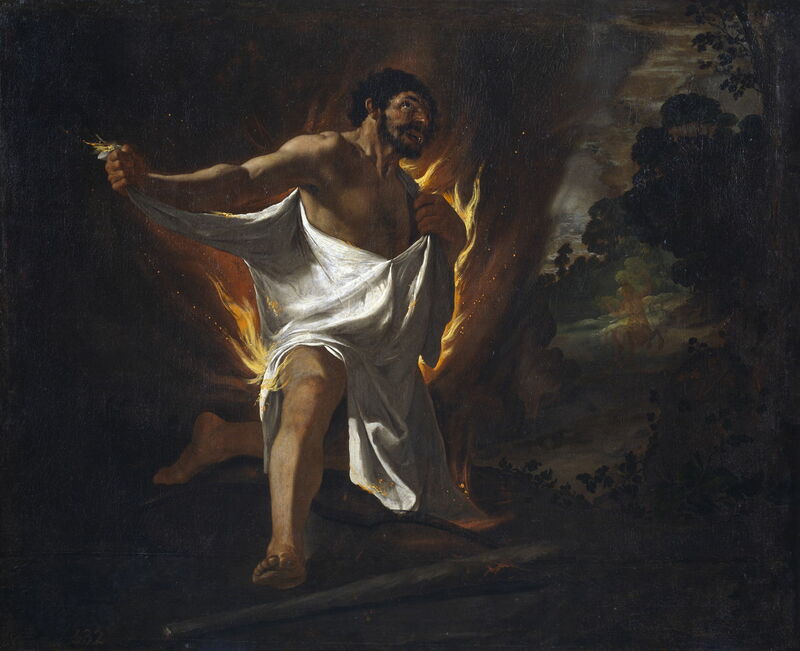 Paintings of the death of Hercules are mostly splendid, but fail to show his body burning from the shirt, or its catastrophic consequences. There is one notable exception. Francisco de Zurbarán’s powerful The Death of Hercules (1634) uses chiaroscuro as stark as any of Caravaggio’s to show a Christian martyrdom, with its victim staring up to heaven, commending his soul to God. Apart from portraits, Zurbarán painted almost exclusively religious motifs, until King Philip IV of Spain commissioned him to produce a series of paintings showing the life of Hercules. The king was a major patron of the arts, the work of Velázquez in particular, and this series was most probably part of his attempt to impress his royal grandeur with the construction of the Buen Retiro Palace in Madrid from 1631 onwards. Later Philip became actively involved with religious mystics, and it is possible that his unconventional beliefs may have included Christianisation of some heroic figures like Hercules, but in the way that Botticelli had interwoven classical myth and Christian beliefs. Paintings of Hercules’ apotheosis have likewise become lost in confused Christian imagery. Although no exception, one stands out for its brilliance. 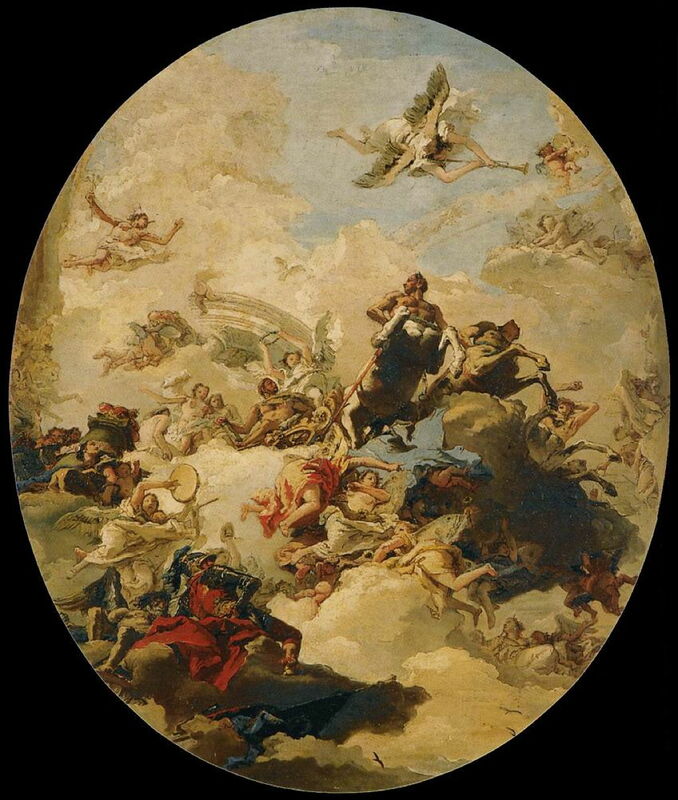 Giovanni Domenico Tiepolo (1727–1804), The Apotheosis of Hercules (c 1765), oil on canvas, 102 x 86 cm, Museo Thyssen-Bornemisza, Madrid, Spain. Wikimedia Commons. Tiepolo’s wonderful The Apotheosis of Hercules (c 1765) portrays this as a saintly ascension, which seems quite inappropriate for Ovid’s story. But it’s still a superb work. Although other paintings have their merits, I hope my small selection does justice to this wonderful story. Posted in General, Language, Life, Painting and tagged Deianira, Delaunay, Hercules, Lagrenée, Metamorphoses, Moreau, myth, narrative, Nessus, Ovid, painting, Rubens, Tiepolo, Zurbarán. Bookmark the permalink.